Early on Tuesday morning, 70 Indian special forces crossed into Myanmar from two north-eastern Indian states, Manipur and Nagaland, and killed more than a dozen militants of two groups, the SCN(K) and the Kanglei Yawol Kanna Lup (KYKL), that had ambushed and killed 18 Indian soldiers a week earlier. Does this portend the new, more aggressive era of Indian counter-terrorism—and perhaps even covert operations—that many anticipated from Prime Minister Narendra Modi? While it's true that the speed of the Indian response is novel, some questionable lessons are being drawn in the breathless press coverage. This isn't helped by the fact that Indian accounts are presently mired in inconsistencies and contradictions. In South Asia and beyond, Islamabad and Beijing are giving New Delhi a run for its money. Indian Prime Minister Narendra Modi visited Bangladesh this week to bolster ties with his eastern neighbor’s pro-India government. In Dhaka, Modi and his Bangladeshi counterpart Sheikh Hasina signed a number of accords, including agreements to resolve long-standing border issues, expand trade, and enhance land and sea connectivity. Modi’s Bangladesh outreach is part of a broader strategy of “SAARC-minus-one,” aimed at integrating members of the South Asian Association for Regional Cooperation (SAARC), except for Pakistan. Similarly, as part of its “Look East” policy, New Delhi plans a more assertive Asia-Pacific strategy, aimed at countering China by strengthening relationships with countries such as Australia, Japan, and South Korea, which fear Chinese hegemony. But as India looks east, it is losing influence to its west to China and Pakistan. India’s inability to consolidate space in South Asia should induce greater caution in assessments of its rise as a global power given its inability to establish dominance in its periphery. India has experienced a flurry of setbacks to its west as of late. One, New Delhi has lost influence in Afghanistan, where President Ashraf Ghani has tilted his government toward Pakistan and China, as part of a bid to secure peace in his country. After coming into office last fall, Ghani’s first foreign visits were to Saudi Arabia, China, and Pakistan. His first presidential trip to India took place this April, after he suspended an arms deal with New Delhi. China and India are among the countries that could purchase Russia’s new T-14 Armata battle tank, according to the Russian government. Vladimir Kozhin, an aide to Russian President Vladimir Putin, tells Russian media that the Russian military will be the first to operate the new tank, which Moscow first unveiled at a parade celebrating the Soviet Union’s victory over Nazi Germany. The need for China makes sense. Although China has largely settled its land border disputes with neighbors, China’s military still lacks a viable battle tank, despite its valiant modernization efforts,. “China’s main battle tank, the Type 99, is still a derivative of the old Soviet T-72 main battle tank, with a design that stretches back to the mid-1980s,” Kyle Mizokami noted on The National Interest back in May. Afghan President Ashraf Ghani has shown the world that his administration is “open for business,” but Afghanistan still faces “a lot of bottlenecks” that need to be addressed, the International Monetary Fund’s top official in Kabul said June 11. Paul Ross, IMF Mission Chief in Afghanistan, said at the Atlantic Council that his counterparts are “optimistic about the long term, but they do see some short-term challenges” in Afghanistan. Will This Chinese Weapon Be Able to Sink an Aircraft Carrier? This week, China has successfully carried out a fourth test of the WU-14 hypersonic glider vehicle (HGV) that conducted “extreme maneuvers” designed to overcome U.S. missile defense systems, Bill Gertz over at The Washington Free Beacon reports. What makes this week’s test launch, which occurred at a test facility in western China, different from previous ones that took place last year – on January 9, August 7, and December 2 – is that the WU-14 allegedly performed “extreme maneuvers”, according to intelligence officials that Gertz spoke to. China is “gravely concerned and indignant” over Japan’s plans to step patrols in the South China Sea. In a regular scheduled press conference on Friday, Chinese foreign ministry spokesperson, Hong Lei, warned Japan to stay out of the South China Sea dispute. Japan is not a party concerned to the South China Sea issue. Recently it has behaved in an abnormal way, deliberately thrust a hand in the South China Sea issue, driven a wedge among regional countries and maliciously created tensions in the South China Sea. Japan’s moves do no good to solve the South China Sea disputes, or safeguard peace and stability of the South China Sea. It also severely damages the political and security mutual trust between China and Japan, and runs counter to the momentum of improving bilateral relations. We once again urge the Japanese side to abide by its commitment of not taking sides on the South China Sea disputes, put an immediate end to the hyping up of the South China Sea issue and groundless accusations against China, stop provoking conflicts among different parties for self-serving interests, genuinely maintain the momentum of improving Sino-Japanese relations and respect the efforts by China and ASEAN countries to safeguard peace and stability of the South China Sea. 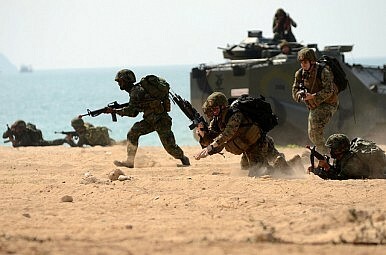 Concerns over increased Chinese assertiveness are leading to greater security cooperation between America's Asian allies. Recognizing the gravity of the deepening crisis in the South China Sea, the world’s leading western powers have begun to speak out. During their latest summit in Germany, the Group of Seven (G7) leaders underlined the “importance of peaceful dispute settlement as well as free and unimpeded lawful use of the world's oceans,” and expressed how they “strongly oppose the use of intimidation, coercion or force, as well as any unilateral actions that seek to change the status quo, such as large-scale land reclamation [author’s own emphasis].” Obviously, it was too diplomatically provocative to explicitly name China, but it was pretty clear which country the Western leaders had in mind. As The Diplomat has noted, Japan has become more active on the South China Sea issue this year. Whether it’s exploring the idea of joint patrols of the area with the United States or boosting defense ties with the Philippines, one of China’s rival claimants in the disputed area, the Shinzo Abe administration is making its presence known in the South China Sea – and Beijing is not happy about it. China dismisses the notion that Japan has any real interests at stake in how the South China Sea disputes are handled. Beijing refuses to acknowledge Japanese (and U.S.) claims that freedom of navigation through this vital shipping lane is at risk. Writing for the Chinese-language edition of Financial Times, Chinese scholar Xue Li argued that Japan’s loudly voiced concern for South China Sea shipping lanes is a “facade” and that Japan’s real motive was a wish to maintain political influence in Southeast Asia and bolster its own position on the East China Sea territorial disputes. The Chinese Ministry of National Defense recentlyreleased its first-ever white paper on military strategy. “China’s Military Strategy” (CMS) outlines a strategy of “active defense” and emphasizes China’s commitment to “winning informationized local wars” and becoming a maritime power. Although the white paper contained no surprises for longtime China watchers and analysts, CMS also contains the first official acknowledgement of China’s commitment to building a cyber force with the capability to engage in offensive cyber operations. Evaluated in the context of concurrent domestic developments and recent incidents, this new strategy offers hints at what to expect as China seeks to advance and defend its “cyber sovereignty” from perceived threats at home and abroad. Chinese bombers participated in a joint air-sea military exercise near Taiwan and the Philippines this week. On Wednesday China announced that the People’s Liberation Army Navy (PLAN) and People’s Liberation Army Air Force (PLAAF) were conducting a joint exercise near the Bashi Channel. The channel sits near islands owned by the Philippines and Taiwan, and the drills were conducted near both of those countries’ Air Defense Identification Zones (ADIZ). A Chinese Navy official downplayed the importance of the drills, claiming they were routine and in line with international law. "Our clumsy statecraft these last few months in the Asia-Pacific betrays a deeply antiquated and dangerous misunderstanding of the Middle Kingdom and how to deal with its growing influence." Jon Huntsman, former U.S. Ambassador to China, declared in 2010 that, “The U.S.-China relationship is the most complex and vital relationship in the world today.” Since then, business leaders and the foreign policy community alike have chimed in with similar proclamations. Alas, our clumsy statecraft these last few months in the Asia-Pacific betrays a deeply antiquated and dangerous misunderstanding of the Middle Kingdom and how to deal with its growing influence. America’s responses to current territorial conflicts in the South China Sea and the expansion of the Asian Infrastructure Investment Bank (AIIB) in April harken back to Cold War containment. Despite its protestations otherwise, the United States has been clearly trying to establish boundaries on China’s power in the Asia-Pacific. For “the world today,” that approach encourages aggression with few benefits. A Chinese Coast Guard vessel (R) passes near the Chinese oil rig, Haiyang Shi You 981 (L) in the South China Sea, about 210 km (130 miles) from the coast of Vietnam June 13, 2014. The Philippines will broadcast a three-part documentary to defend its position on the disputed South China Sea on Friday, countering a Chinese television series that laid out Beijing's so-called nine-dash line claims. The documentary titled "Karapatan sa Dagat", or maritime rights, will be aired on state-run television as the country observes Independence Day. "Our objective is to inform our people," Charles Jose, the foreign ministry spokesman, said adding they hoped to "rally support of our people behind our Philippine government's policy and action". The Philippines has filed an arbitration case against China, which claims almost the entire South China Sea, believed to be rich in energy resources and where $5 trillion ship-borne trade passes every year. Brunei, Malaysia, Vietnam and Taiwan also have claims on the sea. Having achieved its other goals in the P5+1 talks, Iran is now trying to stop inspections of its military sites. Chess is considered to be one of the best games for strategy training. The game's main purpose is to eliminate the opponent's options and reduce the number of his available alternatives until nothing is available—Checkmate! Chess originated in an area which today is part of Iran. It is therefore fitting that Iran’s negotiation strategy with world powers over its nuclear program can be explained according to the rationale of the game. If this analysis reflects the Supreme Leader Khamenei's stance, then Iran’s stated opposition to comprehensive inspections on military sites should not be seen as Iran's red lines. Rather, this public stance reflects a sophisticated strategy aimed to undermine the most important basis for the American policy in the post-nuclear agreement world. Tehran is preparing its final move—Checkmate! The top U.S. military officer likened the expanding American footprint in Iraq Thursday to “lily pads” that will sprout across the pond known as Anbar Province, where the Islamic State of Iraq and Greater Syria seized the capital last month. “Our campaign is built on establishing these ‘lily pads’ that allow us to encourage the Iraqi security forces forward,” Army General Martin Dempsey, chairman of the Joint Chiefs of Staff, told reporters during a visit in Italy. “As they go forward, they may exceed the reach of the particular lily pad”—leading to the creation of new ones. While the strategy may be a new one since the U.S. pulled its forces out of Iraq in 2011, it has been done before. In both Afghanistan and Iraq, similar campaigns were carried out, often called “oil spot” or “ink blot” strategies. The term "Middle East" has become enormously elastic. The name originated with the British Foreign Office in the 19th century. The British divided the region into the Near East, the area closest to the United Kingdom and most of North Africa; the Far East, which was east of British India; and the Middle East, which was between British India and the Near East. It was a useful model for organizing the British Foreign Office and important for the region as well, since the British - and to a lesser extent the French - defined not only the names of the region but also the states that emerged in the Near and Far East. NAPLES, Italy (AP) -- The new U.S. military hub setting up in Iraq's western desert could be a model for more such train-and-advise operations - and with it likely more U.S. troops - designed to help Iraq defeat the Islamic State, the top-ranking American general said Thursday. "Sure, we're looking all the time at whether there might be additional sites necessary," Gen. Martin Dempsey, chairman of the Joint Chiefs of Staff, told reporters traveling with him to Naples, Italy, where he is meeting with U.S. commanders. "It's another one of the options" short of committing U.S. ground combat forces, he said. President Barack Obama has ruled out U.S. ground combat. Dempsey spoke the day after the Obama administration announced that as many as 450 U.S. troops will go over the next two months to al-Taqqadum, situated between the Islamic State-occupied cities of Ramadi and Fallujah in Anbar province, to advise Iraqi forces and help integrate a larger number of Sunni tribal fighters into the Iraqi campaign to retake Ramadi. The House rebuffed an attempt late Wednesday night to eliminate funding for the Obama administration's program to train and equip Syrian rebels to fight against the Islamic State of Iraq and Syria (ISIS). Rep. Curt Clawson's (R-Fla.) amendment to the annual defense appropriations bill failed by a vote of 107-323. His provision would have stripped out the $600 million allocated to assist vetted Syrian opposition groups to defend Syria from ISIS militants and use the money instead to reduce the deficit. Clawson compared the Obama administration's dependence on what he described as "untested" Syrian rebels to serve as "vicarious fighters" against ISIS to the U.S. providing assistance in the 1970s to mujahadeen fighters to combat the Soviet Union. Those militants ultimately became the Taliban. You can download the entire manual at this link. https://db.tt/mMNQg9Hv Sorry to be late in sending this out as a friend just sent me this. I missed then when it was discussed in March, April, and May. I have pasted the table of contents below the article. I guess ISIL is really taking on the image of a state as it is being nice enough to publish its "doctrine" just as we do. Note the discussions on propaganda and guerrilla warfare. Note also the discussion of very recent terrorist events such as in Paris and Denmark. This really is an ISIL unconventional warfare manual (with ISIL Characteristics). As we work to counter-Unconventional Warfare we should study this manual and we should observe for the activities described. 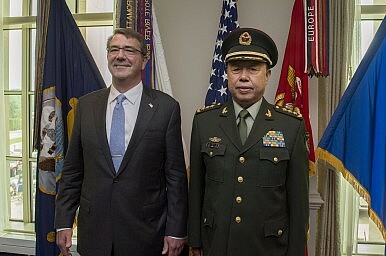 Yesterday, U.S. Secretary of Defense Ashton Carter met with General Fan Changlong, vice chairman of China’s Central Military Commission and one Beijing’s top military officials, at the Pentagon in Washington D.C. to discuss concrete military-to-military cooperation in areas of mutual interest. General Fan is the most senior Chinese military leader to visit Washington since Chinese President Xi Jinping took over the leadership of the Chinese Communist Party. Fan directly reports to Xi, the only person outranking the general in the Central Military Commission. According to DoD News, land reclamation by China and other rival claimants in the South China Sea was one of the principal topics of discussion, with both sides sticking to their positions. Carter once more stated that the United States wants China and all other countries to stop building islands and end the militarization of disputed territories. "It may take the election of a Republican to the White House in 2016 to improve relations between the Russian Federation and the United States." It may take the election of a Republican to the White House in 2016 to improve relations between the Russian Federation and the United States. As improbable as it may sound, the Russian bear shares more interests with the Republican elephant than the Democratic donkey. No doubt leading Republicans will denounce Russian aggression during the campaign season, as former Florida Governor Jeb Bush did recently during his visit to Berlin where he called Russian president Vladimir Putin a “bully.” He added, "I'm not talking about being bellicose, but saying, 'Here are the consequences of your actions.' And that would deter the kind of bad outcome that we don't want to see." But talking tough on the campaign trail is one thing. Governing is another. Perhaps a Republican president would look for ways to move past the increasing confrontation that has characterized the U.S.-Russia relationship in the past few years. Not only is the TPP an integral part of the Asia pivot, but it will also strengthen America's position in the Western Hemisphere. In Washington, it seems that there is rarely an opportunity to pursue a singular policy that strengthens U.S. relations with multiple regions. With constraints on budgets and the inboxes of policymakers, it often seems that attention and resources for one region come at the expense of another. While that is often the case, the Trans-Pacific Partnership (TPP) is a vital chance for policymakers to strengthen relationships with partners in two key regions. The event featured appearances by National Security Adviser Susan E. Rice and Senator Pat Roberts. James Rosen, chief Washington correspondent for Fox News, was the emcee. This past Tuesday leading figures from the world of diplomacy, business and government met at the Mayflower Hotel under the auspices of the Center for the National Interest to honor the service of U.S. Secretary of Defense Ashton B. Carter. The event featured appearances by National Security Adviser Susan E. Rice and Senator Pat Roberts. James Rosen, chief Washington correspondent for Fox News, was the emcee. Rice, a longtime colleague of Carter’s, delivered an impressive tribute. Shepraised his analytic disposition, his effectiveness in “cutting through red tape” to get things done, and the respect that he and his wife Stephanie have “earned from the men and women who wear our country’s uniform.” Rice argued that it is “a tribute to [the Center] and our honoree” that the gathering drew “such a broad cross section of Washington—academics and ambassadors, leaders from Congress and the Administration, Republicans and Democrats.” She added that “for more than twenty years, the Center has reminded us of something we should never forget—that our national security should stand above politics.” Carter, who Rice called “a public servant’s public servant,” enjoys a similar reputation. A group of Russian scholars presented a report in Moscow in late May called "The values of perestroika in the context of modern Russia" that detailed the risks the country is currently facing. The authors argue that leaders must inevitably restart the reforms first begun by former Soviet leader Mikhail Gorbachev in 1985 — that is, unless they plan to continue pushing Russia toward the backward and unstable periphery of the modern world. That allusion to perestroika immediately raises some uncomfortable questions. Is the current rise of authoritarianism and the breakdown of basic institutions the logical consequence of Gorbachev's reforms, or is it some strange evolutionary offshoot, a careless wrong turn down a historical blind alley? Also, how likely is it that the current regime will recognize the need for reforms? Will a new "Gorbachev" emerge from President Vladimir Putin's "politburo," and if so, will he manage to overcome the inertia of his political milieu? With the South China Sea becoming increasingly contested by most regional states, and the United States asserting its freedom of navigation in the area, the chances of conflict seem less and less remote. China has been testing the boundaries of its provocations by building up a series of artificial islands and – just recently – deploying military capabilities on them. This is taking place against the backdrop of a massive and sustained build-up in sea-denial capabilities, including aircraft carriers, submarines, anti-ship ballistic missiles, and reports of the People’s Liberation Army managing to MIRV its DF-5 ICBM. In addition, the Chinese have raised new concerns about South Korea and Japan’s participation in the U.S. ballistic missile defense program. There are more and doubts about the size and shape of the North Korean nuclear arsenal. All these factors mesh together to create an environment in which the U.S. nuclear arsenal has a very important role to play. Dismounted soldiers and Marines often carry upwards of 100 pounds of gear, much of it power-hungry radios and night-vision goggles and sensors (like these tiny drones). Each requires batteries and extra batteries — and that makes the prospect of delivering electricity over a Wi-Fi signal very attractive indeed. If there is a second India-China War, India’s adversary does not need to send troops to the trenches of the Himalayas but only has to ask its cyber warriors to cripple India’s security infrastructure from their air-conditioned rooms. As per an estimation of the National Security Council, China, with its 1.25 lakh cyber security experts, is a potential challenge to India’s cyber security. In humiliating contrast, India has a mere 556 cyber security experts. At stake is India’s US$ 2.1 trillion GDP, power grids, telecommunication lines, air traffic control, the banking system and all computer-dependent enterprises. India and China’s cyber security preparedness is a striking study in contrast. India is a reputed information technology-enabled nation while China struggles with its language handicap. India, with a massive 243 million internet users, has digitized its governance, economy and daily life on an industrial scale without paying adequate attention to securitize the digitization plan. In the digital era, national security is inextricably linked with cyber security, but despite being the single biggest supplier of cyber workforce across the world India failed to secure its bandwidth and falters to detect the simplest of cyber crimes, which often leads to devastating consequences. Yoda has left the building: What does the U.S. Secretary of Defense want the Pentagon’s internal think tank to focus on? Yesterday, the Washington Post reported that the Pentagon’s enigmatic internal think tank, the Office of Net Assessment, has received its directives on the future focus of its research and analysis efforts in the service of the U.S. Secretary of Defense. In a June 4 memo titled “Guidance,” Defense Secretary Ashton Carter outlined that he expects the institution, which has a $10 million annual budget and is headed by ret. Air Force Col. James H. Baker, to focus its expertise more on current defense policy issues rather than hypothetical future threats. Showdown: Is Greece Headed towards a Financial Meltdown? Will Europe's financial crisis ever end? 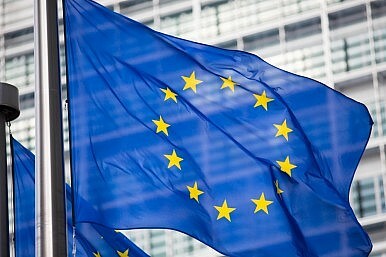 Athens and Europe have agreed to postpone their economic showdown for a few weeks. Currency and financial markets remain skeptical. Rightly so. This is far from a solution. For those who look for a more lasting agreement, much less movement toward a fundamental resolution, it does not even buy much time. The point of urgency (this time) was a June 5 payment due from Athens to the International Monetary Fund (IMF), the first of four. Greece’s government said it had the monies on hand to meet that €300 million obligation. Doubts abounded. Whatever the truth of Greece’s ability to cover this particular payment, it remains plain that Athens cannot make good on the full €1.6 billion due over the course of the month. To discharge that obligation, the Greek government must reach some agreement with the European Union (EU), the European Central Bank (ECB), and the IMF, the so-called troika, to gain access to the €7.2 billion remaining in the bailout fund established in 2012. The IMF, by allowing Greece to bundle all its June obligations into one payment due on June 30, has bought a grand total of some three additional weeks for negotiations. New technology might just dampen the awesome capabilities of one of America's most lethal weapons. What can the Navy do about it? S’pose Bryan Clark has it right. The Center for Strategic and Budgetary Assessments (CSBA) analyst and retired U.S. Navy commander postulates thata technological revolution is about to overtake undersea warfare, rendering the wine-dark sea transparent to hostile antisubmarine (ASW) forces for the first time. This would be a bad thing from the standpoint of U.S. naval mastery. It would place in jeopardy America’s capacity to execute an ambitious foreign policy in distant waters, preside over the liberal maritime order, or accomplish all manner of worthy goals. AMERICA'S ability to project power on behalf of its own interests and in defence of its allies has been the bedrock of the rules-based international order since the end of the second world war. Critical to that effort has been the role of technology in maintaining a military edge over potential adversaries through the first and second “offset strategies”. In the 1950s it offset the Soviet Union’s numerical advantage in conventional forces by accelerating its lead in nuclear weapons. From the late-1970s, after the Soviets closed the gap in nuclear capability, America began making investments in emerging technologies that led to the ability to “look deep and shoot deep” with precision guided munitions. For the next quarter of a century American military dominance was assured. Now, that decisive military edge is being eroded. Why? The same technologies that made America and the West militarily dominant have proliferated to potential foes. 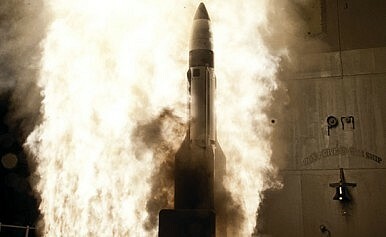 In particular, precision-guided missiles are widely and cheaply available. Rather than investing in the next generation of high-tech weapons to stay far ahead of military competitors, the Pentagon has been focused more on the very different demands of counter-insurgency operations in Iraq and Afghanistan. The top Pentagon officials pushing for an overhaul of the military personnel system are setting their sights on the "up-or-out" rules that have defined active-duty career tracks for generations. Brad Carson, the Defense Department's new personnel chief who has vowed to pursue "revolutionary" change in the way the military manages people, said those rules are ill-suited for recruiting and retaining the high-skilled force that future combat operations will require. Also known as "high-year tenure rules," they require both officers and enlisted troops to leave military service if they fail to get promoted within specified times. The fresh scrutiny of the up-or-out rules comes as top officials are mounting a push for sweeping change to the military personnel system, part of an effort to better compete with the private sector for highly-skilled workers. As the summer finally heats up, so do the takes (I could not help myself) and we’ve got them all right here. From a Robert Kaplan smackdown, to an insider view of the Iran deal, here’s the latest weekend reading list. Also, don’t forget to wish the Army a happy 240th birthday on Sunday. TKO. “Kaplan and others call for imperialism-lite — without acknowledging that empires aren’t always sunny, stable and successful. Policymakers and scholars alike need accurate historical examinations of imperial rule, and need to stay alert to the ways in which local politics, outside political forces and military intervention affect countries in untold and infinitely complex ways.” — Benjamin Denison and Andrew Lebovich offer a compelling rebuttal in the Monkey Cage to Robert Kaplan’s May Foreign Policy articlein which he essentially calls for a return to imperialism in the Middle East and North Africa. Could World War II Have Ended Sooner than It Did?